It’s 4:30 am with the moon still high in the sky, but Palestinians from across the West Bank are already disembarking from buses outside the Qalandia checkpoint near Jerusalem. They’re about to begin a day’s work on the other side of the separation wall, in Israel. Travel support for this article was provided by the Pulitzer Center on Crisis Reporting. Qalandia is one of the busiest checkpoints through which Palestinians with the required work documents can travel from the occupied Palestinian territories to Israel. With unemployment around 26 percent in the West Bank (in Gaza, it’s far worse—among the highest in the world, according to the United Nations), it’s always extremely busy at this early hour, because Palestinians need work, which is more readily available in Israel, especially in construction, manufacturing, and agriculture. Roughly 63,000 Palestinians have Israeli work permits, though it’s estimated that 120,000 Palestinians work for Israelis; 27,000 of them are employed in illegal industrial zones in the West Bank that are operated and owned by Israeli companies, and 30,000 of them work illegally in Israel because they’re unable to obtain the necessary work permits. Permits to work in Israel are routinely revoked for spurious “security” reasons, and Palestinians are rarely given a reason for rejection. Since the so-called “knife intifada” last October, Israel revoked thousands of permits, citing fears of Palestinian terrorism, and the Israeli government is currently discussing a sizable reduction in the tax breaks granted to Palestinian laborers in Israel, which would make a significant dent in their already-meager wages. In the early hours of the morning, Palestinian men (and only a handful of women) rush to beat the long lines and frequent Israeli closures at the checkpoint entrance. Such activity seems incongruous in the predawn hours, when the stark neon lights of the checkpoint are the only illumination for these harried workers. Many smoke cigarettes as they wait in line; one man wears a T-shirt with the words “Chicken Revolution” on the back. Private security is one of the fastest-growing industries in Israel. When it comes to private security, the IDF, and the police, “we can’t differentiate between them,” says Reham, a 22-year-old medical and psychology student at An-Najah University in Nablus. Reham, who hails from Jerusalem, has six more years of study before she’s qualified to become a doctor. We speak to her and her friends just outside the chaotic Qalandia terminal. There’s a long history of humiliation inflicted on Palestinians at checkpoints. The Israeli human-rights group B’Tselem has released countless reports over the years documenting the abuse. 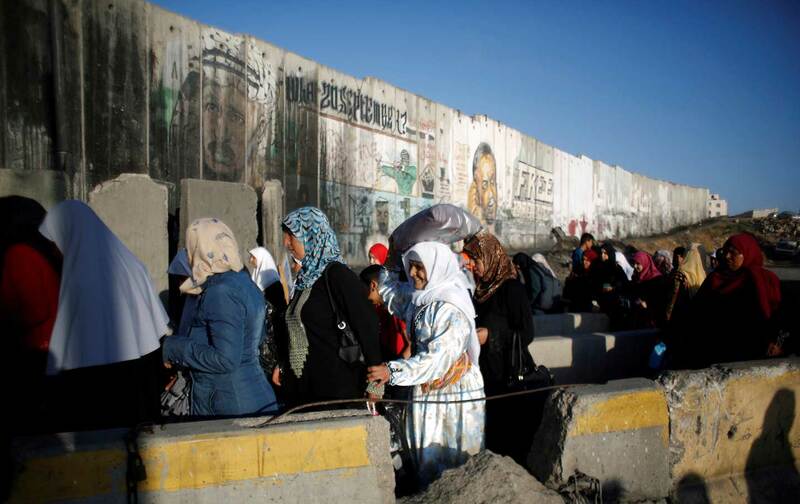 The Israeli women’s organization Machsom Watch has been monitoring the checkpoints since 2001 and advocating on behalf of Palestinians whose work-permit applications are unfairly rejected. As the sun rises on another hot August day, its rays hit the separation wall near the Qalandia checkpoint; on it, one can see ads for apartments in Palestine. Coffee sellers do a roaring business among those waiting in line. A wall near the checkpoint features a large painting of men—“martyrs” to locals—from Qalandia village who have been killed by Israeli security forces. On one level, it’s a mystery why Israel feels it needs more muscle at these checkpoints. Palestinians passing through already face a maze of confusion, and another level of security bureaucracy hasn’t helped. But even if more muscle is needed, why not just send more soldiers? After all, Israel has a captive security labor force in its large conscript army, which requires three years’ service for men and two for women (and reserve duty is obligatory for men until age 51 and for women until age 24). Haddad’s hunch seems to be correct. At the Qalandia checkpoint this past April, two Palestinians—Maram Saleh Abu Ismail, 23, and her brother Ibrahim Saleh Taha, 16—were shot dead by Modi’in Ezrachi guards. It was one of the first high-profile killings carried out by private security guards at a West Bank checkpoint. The siblings, who witnesses said didn’t seem to understand instructions in Hebrew, were branded “terrorists” by the Israeli police because one of them, Ismail, allegedly threw a knife at officers. Not long afterward, the justice ministry announced that it was dropping an investigation into the killings without charging anyone. The Israeli defense minister’s office, the IDF, and Modi’in Ezrachi all ignored our questions about the incident. In theory, these private security guards could be prosecuted in Israeli courts since they’re not protected under Israeli law in the same way as police and soldiers. However, an Israeli court placed a gag order on the case (partially lifted in October), making it impossible to see footage of the shootings and prove the security guards were at fault. The family of the victims were given no recourse to justice. In this way, privatized occupation enforcement serves the interests of the Israeli state. At the Shuafat refugee camp in East Jerusalem, which is surrounded by Israel’s separation wall, we witnessed Ezrachi guards checking the documents of bus and car passengers, taking on many of the roles that used to be done solely by state security forces or police. When we approached the guards, they scowled at us and told us to leave. Black smoke from burning rubbish, collecting near the separation wall, wafted through the air. Israel now has the highest poverty level among developed nations, with the highest level of inequality among children. When we contacted the Israeli Ministry of Defense for comment about its matrix of control across the West Bank, we were told that “some of the crossings receive assistance from companies specializing in security and protection.” The ministry advised us to speak to the IDF for further details, because “the crossing points around Jerusalem” are its responsibility. But the IDF told us, “The Ministry of Defense is the appropriate body to speak with on this subject.” It was a Kafkaesque dead end that gave us a small window into the impossibility facing Palestinians who seek justice for loved ones killed or injured by private security contractors. Of course, after Israel seized control of the West Bank and Gaza in 1967, the state never considered granting universal welfare coverage to Palestinians in the newly conquered territories. Palestinians under occupation were subject to military rule, a policy that continues to this day. From the late 1970s, right-wing governments in Israel, led by the Likud Party, argued that dismantling the welfare state was the best way to liberalize the economy. Simha Erlich, Israel’s finance minister from 1977 until 1979, boasted that hardline economist and privatization zealot Milton Friedman was his economic adviser. Hever continues: “Actual privatization of large government-­owned companies started in the 1990s, and privatization in the defense sector followed later, first with the sale of factories out of government-owned arms companies, and later with massive outsourcing of security operations to private companies during the second intifada.” Israel was following the model set by Ronald Reagan’s America and Margaret Thatcher’s Britain. Indeed, the US military industry encouraged the Israelis to privatize their weapons industry. Today, the results of outsourcing are clear. Israeli Prime Minister Benjamin Netanyahu is committed to selling off billions of dollars in state assets, a policy he’s proudly championed for years and one he started during his first term in office in the late 1990s. But the Israeli public is paying a high price. Israel now has the highest poverty level among the nations of the Organisation for Economic Co-operation and Development. According to UNICEF, in 2016 Israel showed the highest level of inequality among children in the world’s 41 most developed states, with one-third living below the poverty line. In 2015, Israel’s National Insurance Institute estimated that there were 1.7 million poor people in the country, out of a population of about 8 million. The pay gap has also widened, and increases in the cost of living and high rents led to massive protests in 2011. But not everybody is suffering. The country’s military establishment is both privatizing the weapons sector and selling this technology abroad. Israeli writer and activist Jeff Halper argues in his book War Against the People: Israel, the Palestinians and the Global Pacification (2015) that the occupation isn’t a burden for Israel but a “resource,” because it gives the Jewish state the opportunity to test weapons and surveillance in the field on Palestinians, along with assisting other states in their military and intelligence needs. Growing numbers of European and US officials have been visiting Israel in recent years to learn about its security and defense systems. This is just one way that Israel’s vast expertise in occupation, from militarizing borders to surveilling unwanted populations, has become a huge financial boon for one sector of the Israeli economy. It isn’t helping most of the population—poverty is rife, after all—and according to economist Hever, it’s not enough to insulate Israel from potential economic headwinds from the growing BDS (boycott, divestment, and sanctions) movement. “BDS is not about the size of exports but awareness of international law,” he says. “Recently, BDS activists have made some advances in regards to the arms industry itself, starting a debate in the EU about the funneling of research funds into Israel’s arms industry and convincing key Brazilian politicians to reconsider arm deals with Israeli weapons companies.” Indeed, Hever questions the viability of Israel’s defense industry. “The arms sector in Israel is larger compared to the size of the economy than in any other country in the world,” he tells us, “but its relative share of the Israeli export market is declining.” In 2015, Israeli military exports were relatively flat, at $5.7 billion. For Israelis, the West Bank has become a kind of special economic zone, where settlements often provide more profitable business conditions—low rents, favorable tax rates, government subsidies, and access to cheap Palestinian labor—than in Israel proper. It’s a draw for Israeli companies, but also for the international market, and a lot of money is being made. Foreign direct investment in the West Bank and Gaza spiked from $9.5 million in 2002 to $300 million in 2009, before plateauing back to $120 million in 2015. The American computing behemoth Hewlett-Packard, for example, developed the biometric ID cards used by Israeli security forces at West Bank checkpoints. HRW reports that there are 20 Israeli-administered industrial zones in the West Bank, covering about 1,365 hectares, with Israeli settlers overseeing the cultivation of 9,300 hectares of agricultural land. The researchers conclude that “by virtue of doing business in or with settlements or settlement businesses, [foreign] companies contribute to…violations of international humanitarian law and human rights abuses.” This knowledge is beginning to have an effect. This is one of the contradictions of privatization. While Israeli state transgressions of international law are generally ignored by its biggest benefactor, the United States (President Obama just gave Israel its largest-ever military-aid package), the BDS movement has claimed some key victories in terms of pressuring the private sector over affiliations with human-rights abuses in Palestine. For example, the French infrastructure firm Veolia announced in April 2015 that it was leaving Israel, while the British mobile-phone company Orange said just a few months later that it would terminate contracts with its Israeli partner. This poses the question of whether the privatization of the occupation is making Israel more susceptible to international opprobrium, including boycotts. The security company G4S, the biggest private-sector security employer in the world, announced in 2014 that it was leaving Israel within three years and terminating its contracts with the Israeli prison system. (BDS claimed a victory, but when contacted by The Nation, G4S said that while it still planned for a full pullout by June 2017, “the decision to not renew the contracts was taken for commercial reasons.”) That system now holds 6,295 Palestinians as prisoners and security detainees (including, at the end of 2015, 116 Palestinian children between the ages of 12 and 15). In 2009, the Israeli Supreme Court ruled that plans for fully private prisons were unconstitutional. But many of the systems and products used in prison—from cameras to doors to alarm systems—are made or managed by private corporations. With the Middle East aflame, and Israel selling itself as an island of stability amid a region in conflict, there are few compelling reasons why the Jewish state won’t continue to market itself as a model in how to manage unwanted populations, with private companies the beneficiaries of this policy. Next year will mark the 50th anniversary of Israel’s occupation of Palestine, and the colonization is increasing. Without massive inter­national pressure, it’s impossible to see how the outsourced occupation won’t become a permanent nightmare. Matt KennardMatt Kennard is an investigative journalist working for the Latin America Bureau in London. He is the author of two books, Irregular Army and The Racket.